@lisa-summey , are you still having problems with this? Do you think you got the dulcimer tuned correctly with your electronic tuner? Is it holding now? You have received good advice. Put new strings on it of the right gauge, tighten the tuners that slip, make sure your electronic tuner is calibrated to A=440 and tune as Skip said, A and D below middle C.
That tuner should work just fine. Check the calibration, it should be set to 440. Maybe one of the folks here will recognize the name and the instrument. In any case it will be fine to learn on. The one thing I can think of that may cause a problem later is it may not be made for equal temperament tuning. As long as you play alone that should not be a problem. Certainly looks good for a starter instrument. As mentioned, the tuners are easily tightened to keep the tuning pegs from slipping. Tighten them 1/8 turn, and then try to adjust the tuning and see if they still slip. When tuning strings, Do Not tune 'still' strings. Hold the tuner and pluck the string. While it's still humming, give the tuner knob a quarter turn. If the sound if the string did not go up or down, STOP, and move the tuning knob back. You have the wrong tuner for that string. Try again. FYI, I've attached a copy of an article I wrote several years ago called I Just Got A Dulcimer, Now What? It is an illustrated glossary of dulcimer terms so we all speak the same lingo. Plus it has answers to many beginner questions about the tuning, playing, care and feeding of your instrument. Hi Lisa, I'm up the road from you in Cary. We have a lot of dulcimer groups, workshops, and jams in NC. Welcome to the club. IMHO, a good cleaning and conditioning, and some new tuners and strings, and it looks to me like you got lucky at the thrift store! Lisa, can you tell us the length, in inches, between the nut and the bridge? If it's 28" or longer, it might be a bit of a strain for those cheaper older tuners to hold the strings up to DAA or DAd. I have an old 1970s kit dulcimer that had tuners like yours, and the screw threads just didn't hold very well anymore. Perhaps if you get slightly lighter gauge strings, and/or tune down a step to CGG or CGC (instead of DAA or DAd) ...the tuners might be better at holding. 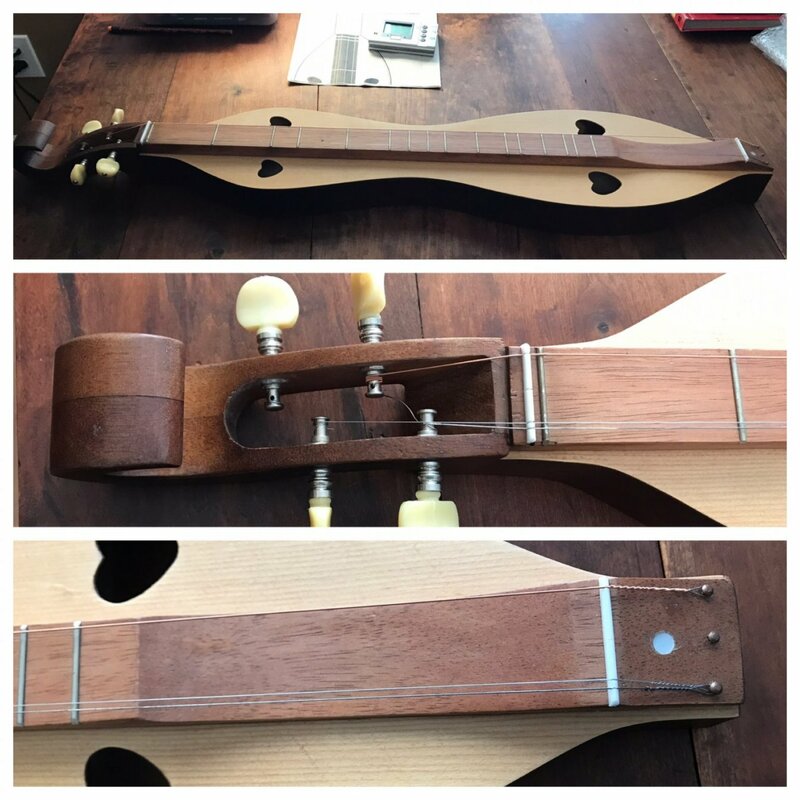 I wound up replacing the tuners on mine with some new (but using same sized holes) inexpensive tuners... that helped, but actually it didn't totally cure the issue for my kit dulcimer, alas. Mine remains a little frustrating to tune. Your mileage may vary. @skip, thank you. There is no label inside the dulcimer. There is a sticker on the back that says 559-1261. It came with a little booklet by Robert Hahnen copyright 1978, but I don’t know the age of the dulcimer. 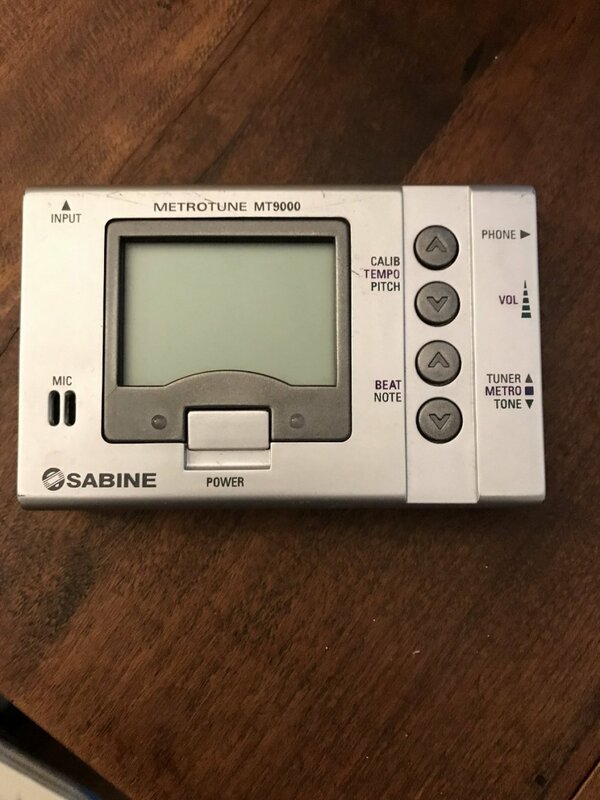 I used a tuner from my son’s violin days. Should I not use that? @kevin-r, thank you. I did turn the screw in the end of the peg ever so slightly after multiple attempts to tune the middle string. Once I did that, it would still turn back, but much more slowly. Perhaps the strings that were on it were not installed properly? It did seem that the middle string was significantly shorter than the others, but maybe that’s normal. It' looks good to me. There may be a label inside at the lower hearts. The pegs can be adjusted by tightening the screw on the end of the pegs, it won't take much. New strings are probably justified but you can loosen then move the longer of the melody strings to the center position temporarily. Loosen it enough to remove it from the nail on the end and move it over also. The D and A you're looking for are the ones just below middle C. You can find a sound bit of C with a search. I am no expert, but I'm thinking you just need a new set of strings. As far as the pegs slipping I think that might easily be fixed too. It looks like there is a screw that goes thru the tuning peg. Maybe if you just tighten it slightly it will hold better. I wouldn't tighten it too much. Just enough to hold the peg in place. Hope this helps some. I'm sure someone else more knowledgeable will chime in soon if I am wrong. Good luck! I am new to this group and the dulcimer. I purchased a used dulcimer at a local thrift shop and quickly fell in love with the idea of learning to play the instrument based on some videos I watched. My original goal was to use this instrument to see if I could learn to play and later upgrade. The first thing I did was attempt to tune the dulcimer. I was trying for DAA. I had to work a bit to get the D to hold, but eventually I got it. The middle string was very challenging because I realized the pegs were slipping. I could see it slowly turning. There was a high pitched sound as the peg turned back. Eventually, I could get to A, although it didn’t hold for long and I started to work on strumming. On an attempt to tune the middle string to A, it popped. Now I am left wondering if this instrument is good enough to learn the basics on and have new strings installed, or if I just need to find another dulcimer. After looking at pictures of other Dulcimers, I suspect this may not be very well made. I will attach a few pictures and I appreciate any feedback. Thanks so much.